Tue, Apr 16, 2019, 08:07 pm SL Time, ColomboPage News Desk, Sri Lanka. 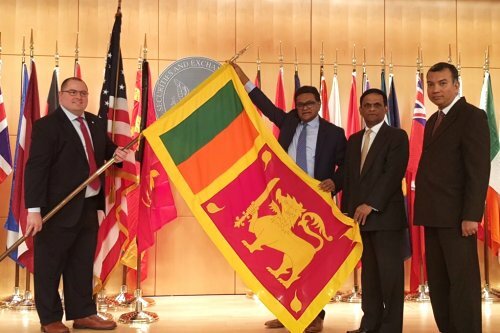 Apr 16, Washington, DC: As a gesture of goodwill in appreciation of the decades of friendship and cooperation between the Securities and Exchange Commission (SEC) of Sri Lanka and the United States Securities and Exchange Commission (US SEC), the National Flag of Sri Lanka was placed in the auditorium of the US SEC as a permanent display on 05 April 2019. The National Flag was placed in the auditorium of the US SEC by the Chairman of the SEC, Ranel Wijesinha, Charg� d' Affaires a.i. of the Embassy of Sri Lanka in Washington DC, Sarath Dissanayake and Minister Commercial of the Embassy, Sumedha Ponnamperuma. US SEC's Assistant Director International Affairs, Matthew Greiner and Program Manager International Affairs, Adam Anicich also attended the event. Sri Lanka attends the International Institute for Securities Market Growth and Development annually. This year's event was attended by over 150 regulators from 70 countries and the Sri Lanka delegation also included Manager of SEC Sri Lanka's supervision division Saumi Koddipily.